Bluetooth seems to be becoming a really cool thing. Even though I haven't succeeded in getting very far with it myself. For the uninitiated, Bluetooth is a standard that allows cellphones, headsets, handhelds, laptops, or whatever, to communicate wirelessly with each other over short distances, like when they're within the same room. I've got a Nokia 6310i phone with bluetooth and GPRS (for always-on Internet kind of stuff) and a Palm handheld with a bluetooth card. The idea was that the Palm would use the phone (while still in my pocket) for Internet connection, and be able to run ICQ instant messaging all the time. Well, I succeeded in making that work only once or twice, for a short period of time. The phone seems to have trouble connecting and disconnects often. It seems like other owners of the 6310i have similar problems, and I probably should have chosen the Sony Ericsson T68, which was what my cell provider actually recommended, and which apparently does bluetooth beautifully. The bluetooth adapter for my Palm m505 is kind of fragile the way it sticks out, so it wouldn't really be practical to leave it plugged in in my pocket. And I just had to have the Palm serviced because the connector for the little bluetooth card no longer held it in. And even when I got the connection to work, I realized quickly that my Palm organizer shut off after two minutes or so, breaking the connection, so there was no way I could keep ICQ running. Anyway, others are having more fun. A Swedish programmer came up with a way of using his cellphone for remote controlling his Macintosh. The latest Mac laptops come with built-in bluetooth, and it apparently talks beautifully with Sony Ericsson phones. So this guy made a program that allows you to start and stop music on the Mac. And other people are coming up with new scripts. Like, the Mac can know when you walk into the room, and can start picking up your e-mail, and that kind of thing. "I am in Levi, Finland, at a meeting where we are talking and playing and working wireless. I pull out my laptop, fire up the bluetooth manager to connect with my cell phone to dial up a connection and ... whoa ... is this slooooow ... where *did* the connection go ... and just when I am about to give up I see hundreds of bluetooth devices on my laptop's bluetooth manager! Headsets, phones, devices, all revealing themselves in low security mode. It's a shock, as I can hardly believe my eyes. Like looking at a Windows Networking window at a LAN party or conference, but these are phones and devices and laptops aplenty. Later I try it in my room and the same thing happens, with a few less connections but the same effect..."
It is a couple of years since I was in Helsinki, but it certainly was cellphone central with everybody being glued to a Nokia phone. Timothy Wilken mentions "GIFTING IT: A Burning Embrace of Gift Economy", a documentary by Renea Roberts about the gift economy at work in the annual Burning Man festival. I haven't never made it to Burning Man so far. Usually I remember about it too late to make plans. But I've been well aware how it in many ways presents a model for a new and better way of organizing society. You know, creative people think of what they feel ought to be added to the soup. What is needed, or what would be cool. They collaborate on making it happen. It is usually a gift to the whole. And it is wild and exciting, and it blows your mind. Or it is a little thing that is there when you need it. An elaborate infrastructure emerges in the middle of a barren desert. It is peaceful. It is an experience. It has the most marvelous diversity, woven into a common fabric. It all gets cleaned up when it is done, and it doesn't leave a trace. 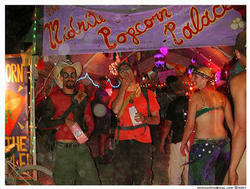 Many documentaries have been made about Burning Man, but this is apparently the first that focuses on the gift economy. On how the openness and the connection with others is what makes it work. Based on experiences with Hiptop Nation, it appears that by having ubiquitous mobile data communication devices and a successful communal blog, it is possible to create an ideal environment within which a smart mob can grow into a goal-oriented mobile community of practice. Communal blogs play a critical role in the creation of three essential elements of community: the establishment of social capital, the creation of weak ties that foster creativity, and the formation of a sense of “place” within which everything can happen. (3, 4, 5). The final crucial ingredient is a complex goal. In these special circumstances, a smart mob can not only quickly change into a mobile community of practice, but once its goals have been achieved it can just as quickly “dissolve” back into a smart mob. This is metaphorically similar to the way certain liquid solutions can quickly crystallize, dissolve back into liquid, and then recrystallize based on external influences. By adding an external influence, namely a specific shared goal, one can “precipitate” the crystallization of these smart mobs into powerful mobile communities of practice. After the goals have been achieved, during which participants have gained expertise in their particular domains, the group can dissolve back into a smart mob and be ready to rapidly recrystallize whenever new goals are introduced. The increasing popularity of communal blogs, coupled with more sophisticated ubiquitous mobile communication devices (9, 10, 11), will most likely make this interesting social phenomenon more common in the future. A future opportunity will be the deliberate cultivation of this phenomenon, as it has the ability to create incredibly effective and creative goal-oriented teams of mobile individuals. I like the crystalization and dissolution thing. And, yes, blogs and mobile data devices and a shared goal are good pre-conditions for ad hoc organization to happen. 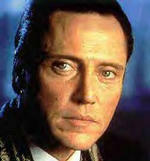 I was just watching an interview with Christopher Walken on the Charlie Rose Show. He mentioned that the way he studies a script to prepare for a movie is as follows: He lays out all the pages in front of him in his kitchen and then he goes through them backwards, reading only his own lines, not looking at the other people's lines at all. Then he tries doing the lines in different voices, like as Elvis or as a U-boat commander, etc., still backwards. He does that until he finds the rhythm of it all, and it feels natural. He doesn't pay attention to the story. And when it feels right, and he senses the rhythm, then he goes and shows up on the set. And somehow, magically, his interpretation of the character always fits. But at the same time it always comes from an unexpected and unpredictable, possibly unnerving and unsettling, but always delightful place. ...Hm, I seem to find some deep wisdom there, that applies to many other things in life. Don't just try to fit in and do what is expected and required of you. Go and find your own true rhythm, and when you really feel it, come in and discover that, miraculously, it fits perfectly with everybody else's rhythms, and together we manifest something wonderful that has never before been seen.